The TOA VM-3000 Series is a highly cost-effective combined emergency voice alarm system and public address system. The VM-3000 Series is ideal for small and medium-sized applications, such as shopping centres, retail stores, nursing homes, schools and fitness clubs. The TOA VM-3000 Series is a highly cost-effective combined emergency voice alarm system and public address system. The VM-3000 Series is ideal for small and medium-sized applications, such as shopping centres, retail stores, nursing homes, schools and fitness clubs. It incorporates such emergency voice alarm functions as continuous speaker line monitoring and a built-in voice alarm. This easy to install and set-up, all-in-one system also offers PA broadcasting, paging and BGM functions that operate with uncompromisingly high audio quality to ensure consistently high intelligibility. 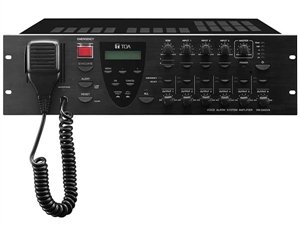 The VM-3000 Series is digitally audio processed and controlled, with full digital audio mixing and a built-in high-quality electronic voice message feature. The system may be set up directly using the controls and LCD display on the front panel, also enabling easy operation of the system. Operational versatility is further enhanced by a dedicated software configuration capability for entering and updating settings via a PC.